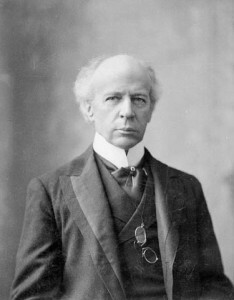 Wilfred Laurier (1841-1919) was prime minister of Canada from 1896 to 1911. Born at Saint-Lin, Canada East, Laurier was elected to the Québec legislature in 1871. In 1874, he was elected to the House of Commons, of which he was a member until his death. When the Liberal party won the 1896 election, Laurier became prime minister. The decision to expand the railway system by building two new railways, the Grand Trunk Pacific and the National Transcontinental, caused a serious rift within the party, a factor in the Liberal’s defeat in the 1911 general elections. At 3580 m (11,750 feet), Mount Sir Wilfrid Laurier is the highest peak of the Interior Ranges of B.C. The first ascent was made in 1924 by Allen Carpe, R.T. Chamberlin, and A. L. Withers.